A Ebola doctor back home from fighting the Ebola virus endemic in the Congo Africa, is finally back home. Belfast-born doctor Stacey Mearns has just returned from North Kivu in the Democratic Republic of Congo where she has been fighting the Ebola Outbreak. She arrived home today after treating Ebola patients in Congo Africa. It is the second time Dr Mearns, who works for the International Rescue Committee, has battled the disease. Dr Mearns admitted that when she came back she did feel a bit “paranoid”. “Every time you get a headache or something, you fear the worst,” she said. However, she added: “I’ve been doing emergency work now for the last five years and I’m quite accustomed to adjusting when I come back home and just being thankful for being at home. She worked in Sierra Leone during the West Africa outbreak, which killed more than 11,300 people between 2014 and 2016. “In West Africa, I think as a global community we left it quite late to respond,” Dr Mearns said. “By the time we had the financial resources and enough partners on the ground, the outbreak was already very out of control. However, she said a big difference between the outbreaks was the dangerous political situation in DR Congo. “In West Africa we didn’t have to deal with that, those three countries [Sierra Leone, Guinea and Liberia] were relatively stable, whereas North Kivu has over 100 armed groups and an active conflict, so that’s one striking difference that’s actually made controlling the outbreak really difficult,” she said. “With Ebola, you do learn how to protect yourself and the measures you can put in place to protect you from acquiring the virus. “But with conflict, there’s a whole different dimension associated with that. Dr Mearns, a former NHS doctor who joined the International Rescue Committee (IRC) four years ago, said lessons learned from the earlier West Africa outbreak have been used in the DR Congo outbreak. Ebola broke out there last year and has so far resulted in the deaths of about 700 people. Humanitarian group Médecins Sans Frontières (MSF) has pulled out of the Butembo area of DR Congo due to the security situation. In the past month, four Ebola clinics have been attacked, while a male nurse was strangled in front of his wife. “The situation is hazardous,” she said. Dr Mearns said some people in the area believe Ebola was deliberately introduced as a political tool to enrich those in power while rumors have also circulated that if you go for the vaccine, you are actually injecting people with Ebola. Dr Mearns said that while, as a former NHS doctor, she had seen people die, nothing could have prepared her for the volume and pace of death she witnessed working in Sierra Leone. “There was a period where dead bodies were just being dumped all over the hospital,” she said. “I think the worst day, I saw 25 people in body bags. That was a combination of bodies dumped around the hospital and people dying inside the unit. “It felt like everyone was just dying and that was a very tough environment to work in. Dr Mearns said that the population of North Kivu had already endured much before the Ebola outbreak. “There’s been fighting there for 15 or 20 years and it’s affected every facet of people’s lives,” she said. “So people are understandably frustrated when they see a lot of attention and resources come in for Ebola, but not the same for the broader conditions and the violence. “We’re eight months into the outbreak and we’re seeing it currently spread at its fastest rate yet. International Development Secretary Penny Mordaunt said the UK was playing a key role in combating the disease. 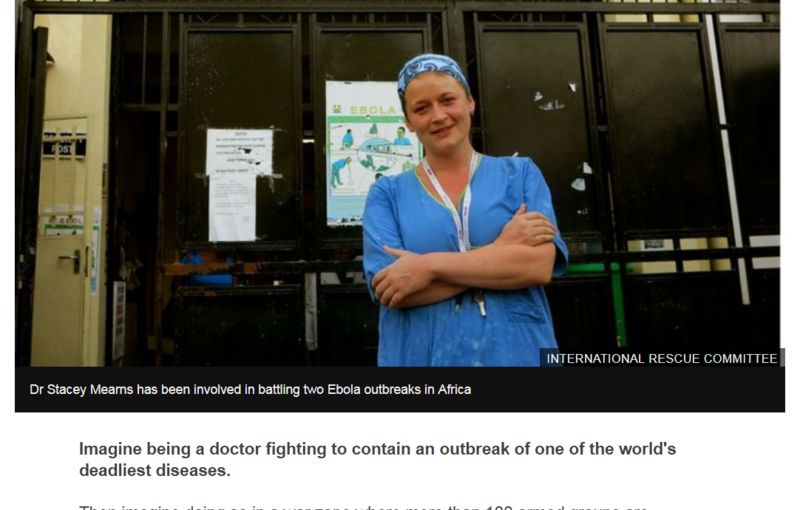 “From helping to put specialists like Dr Mearns on the ground, to developing a vaccine – the UK is playing a crucial role in the fight against Ebola,” she said.